If you are a fan of Pixar’s animation hit, Coco, you will be glad to know that Disney has added it to Epcot in the Mexico Pavilion. If you haven’t yet seen the Pixar movie Coco, it is about Miguel, a 12 year old boy, who embarks on an extraordinary journey to the magical land of his ancestors. The movie centers around Dia de los Muertos (Day of the Dead), a Mexican celebration that involves showing respect to the ancestor’s who have crossed over. You’ll find that the Mexico Pavilion features Coco at Epcot. The main building in the Mexico Pavilion, the pyramid, has been transformed into a tribute to Dia de los Muertos along with Pixar’s Animated feature Coco. There are interactive displays and tons of Coco souvenirs for sale inside. This is definitely the place you want to go if you are looking for Coco at Epcot! When you walk inside the pyramid, you will notice right away that the space has been transformed to showcase for all things Coco, focusing on Dia de los Muertos. When you enter, you can’t help but notice the two large sculptures in the center of the room. 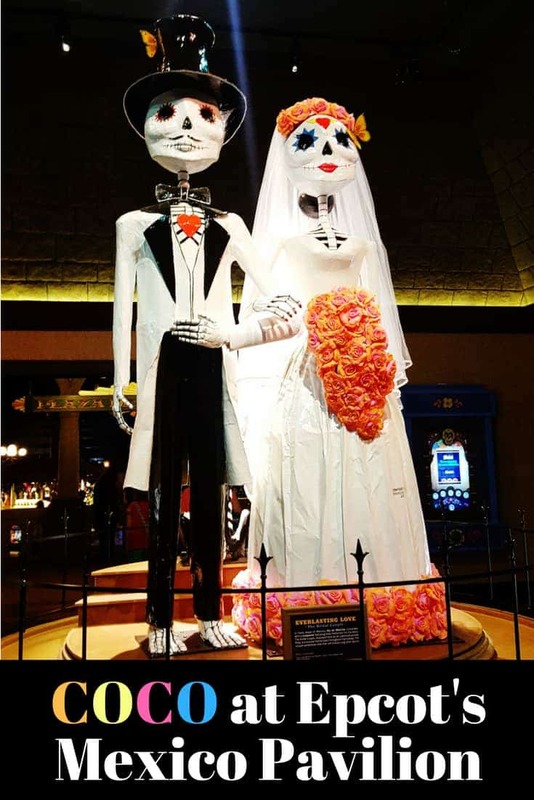 The largest is the Dia de los Muertos Bridal Couple who symbolize that love that remains long after death. 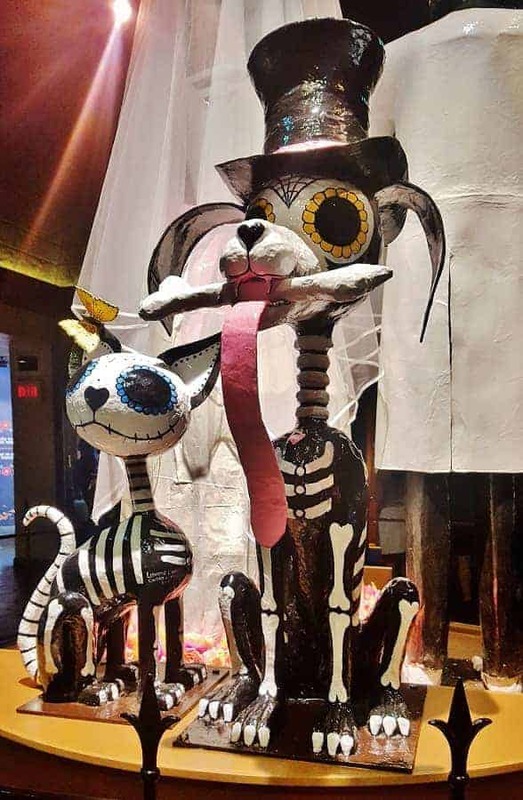 On the other side of the Bridal Couple is a Dia de los Muertos sculpture of a dog & cat which symbolizes the friendship and eternal love for our animals. On all of the interior walls, you will find information about Coco and Dia de los Muertos in case you aren’t familiar with the movie or Dia de los Muertos. Disney has done a great job of creating signage that explains the celebration as well as how it connects to the movie. 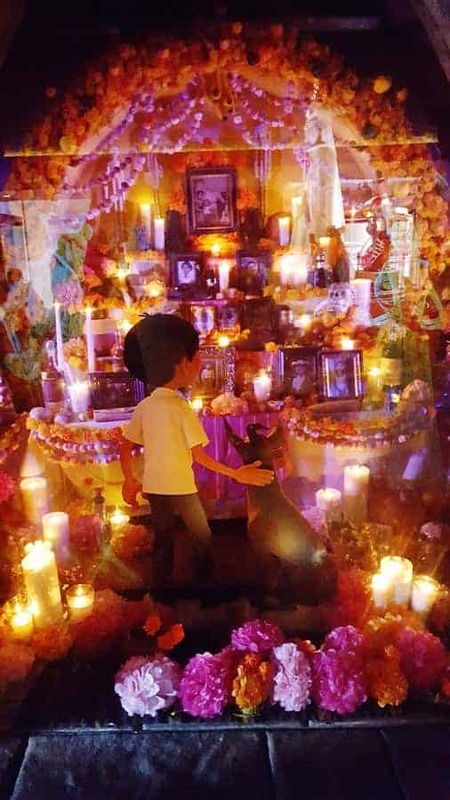 As you walk through the room, you will find different scenes from the movie Coco. One is the beautiful Ofrenda scene where Miguel begins to learn about his ancestors. Take your time to look at everything carefully as these pieces are beautifully done! There is another scene that shows people preparing for the Dia de los Muertos. Take a hard look into the Mirror de los Muertos and may find yourself as a skeleton in the Land of the Dead! If you are looking for Coco souvenirs at Epcot, you will want to go to Mexico Pavilion. As you pass into Plaza de Los Amigos, you will find many souvenir displays featuring the characters from Coco. 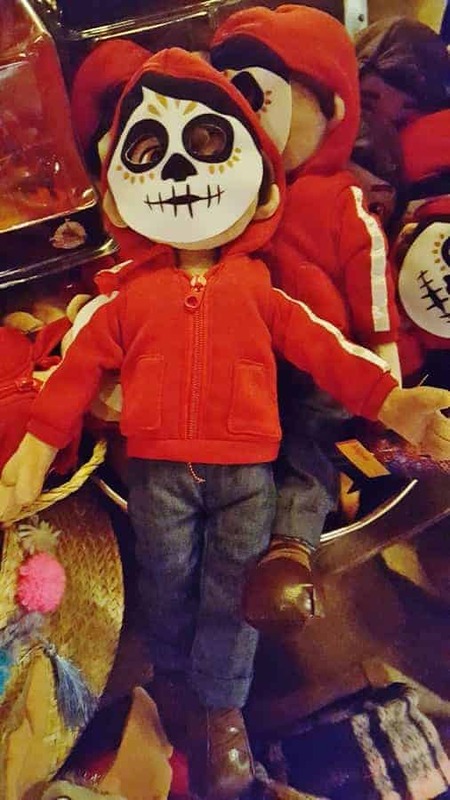 There are Coco toys, Miguel dolls and Coco t-shirts. You will also find a large selection of Oaxacan wood carvings! We were excited to see how the space inside the Mexico pavilion has been transformed! Guests visiting the Mexico pavilion can also experience the Story of Coco through the Mariachi Cobre. This new addition to Mexico pavilion takes you on a musical journey with Miguel. As huge fans of the movie, Coco, we found this addition to the Mexico Pavilion to be perfect. There is some speculation that The Caballeros ride may eventually be turned into a Coco inspired ride. Wouldn’t that be a great awesome! Have you had a chance to spot the displays for Coco at Epcot?